Last updated by Miloslaw Smyk on 2006-12-12. Newsflash! We're now listed on Wikipedia too! (...)What do we actually see when we look up at the Moon with the naked eye? We make out a configuration of irregular bright and dark markings - not a close representation of any familiar object. But, almost irresisitibly, our eyes connect the markings, emphasizing some, ignoring others. We seek a pattern, and we find one. In world myth and folklore, many images are seen: a woman weaving, stands of laurel trees, an elephant jumping off a cliff, a girl with a basket on her back, a rabbit, the lunar intestines spilled out on its surface after evisceration by an irritable flightless bird, a woman pounding tapa cloth, a four-eyed jaguar. People of one culture have trouble understanding how such bizzare things could be seen by the people of another. At this moment I realized this was a good occasion to put to use photos of the Moon I made with my Uniwersal 150mm telescope (model 8). I quickly grabbed a photo album from a shelf and began staring at a shot that you can see all over this page. It wasn't long when shapes began to emerge - from very simple, to complicated and detailed. I was so moved by my "discovery", that I immediately wanted to share it with someone and rushed to my neighbors. Together we located more interesting patterns, including "Young girl" and "The priest". Below you can see several of our findings. Next to each of them I put a plain photo of the Moon, so that you can quickly move your eyes from marked to unretouched photo and locate the pattern yourself. Please bear in mind that the black "overlays" are not exact copies of the underlying shapes - this was not my intention. Instead, they are here to tell you where to look and on which elements to concentrate. When you find them on the unretouched shot, you'll often realize that they are much more detailed, with delicate shades and additional features I was not able to render with my crude drawings. This is probably the easiest pattern to spot. 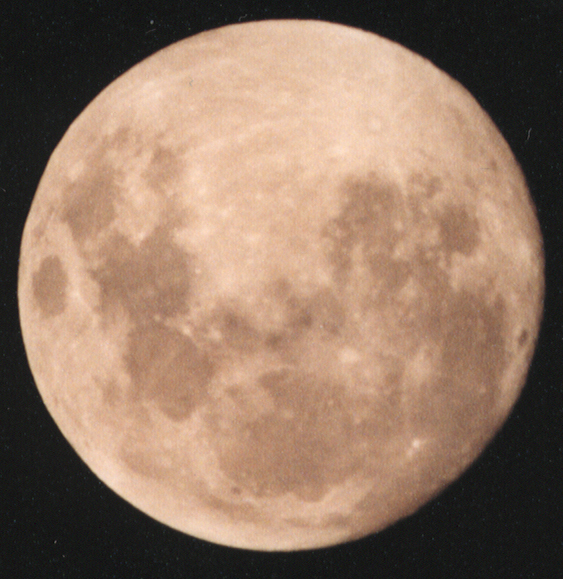 The face is cartoon-like, without much shading, but is quite big and easily noticeable on almost any Moon shot. The pirate. Well, I called it that way, because this certainly is a bad face. Faces of arab sorcerers are being caricatured in a similar way. It is drawn with thick line, but many details are visible in the face anyway. You may consider its beard longer than I indicated in the overlay. While the human part of the body isn't very convincing, please have a look at the head. It's the head of a young lion, with its eyes, nose and hair clearly visible. The ears are also in their proper location. Unfortunately, it's lit from (lion's) left, so its right side is in the shadow. Well, this dog-face is not very detailed, it is missing some important details and the quality of the overlay is poor. But it's a dog with big ears anyway. When my friend found this man, he insisted he was a knight, but careful inspection of man's "hat" revealed that he was rather a priest (bishop perhaps) of some sort. This one pictures "Yelling Grandma" (or something similar, but yelling anyway). This one shows "Closed-eye Egyptian". This one's called "The Indian in the moon". According to several Native American Cultures, the moon depicts an Indian man sitting cross-legged on a blanket and praying. He must be praying pretty hard for his braids to go flying like that! And this is it for the moment, I hope I managed to get your imagination started. Please look for other weird things on the Moon and if you find something extraordinary, send me 186x191 GIF image with your finding overlayed in a way you see on this page, along with your comments. I'll then put it here and give you a proper credit. The quote from Sagan mentions many shapes that one could try to find, by the way. Here is the Moon image I used for you to download and, if you need it, original 563x579 Moon shot (JPEG 330KB). Images from this site have been featured in @discovery.ca episode 1192, dated April 19, 2000. You can see RealVideo version of the show (hint: fast forward 29 minutes into the show).